As we age, skin cells become sluggish and regeneration slows down. 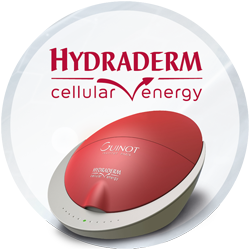 Hydraderm Cellular Energy’s Dynamic Ionisation reawakens energy within the skin cells whilst speeding up the enzymes responsible for repairing damage and stress caused to the skin. Combining this Dynamic Ionisation with Thermal Energy, the oxygen level within the skin is increased, cellular regeneration is accelerated and toxins are eliminated to reveal a brighter, more youthful complexion. Using expert anti-ageing techniques, this Treatment visibly rejuvenates the complexion for immediate visible results. Skin is revitalised whilst lines and wrinkles are smoothed. Uses natural sources to provide essential oils and plant concentrates for the Aromatic treatment to bring natural beauty to your skin. The unique, personalised treatment method combines the benefits of essential oils with massaging techniques to fill your skin with energy and provide a long-lasting effect. Concluding with an Aromatic mask your skin will recover its natural radiance. Instantly reduces the appearance of fine lines and wrinkles. This relaxing treatment decongest's the eye area to reduce the appearance of puffiness and dark circles, revealing younger and brighter eyes. The Age Summum treatment is the alternative to plastic surgery for treating immediate signs of ageing: wrinkles and fines lines, loss of firmness and lack of radiance. After just one treatment, the face appears several years younger. The skin's surface looks more youthful. Wrinkles and fine lines are filled in and smoothed away. Skin texture is refined and the skin recovers a youthful radiant glow. The ‘Quick Lift’ when time is short, this express Treatment tones the muscles revealing visible results for those wanting a quick boost. An express treatment designed to cleanse the face paying particular attention to the T-zone. The Thermoclean heating electrode diffuses gentle heat that rids the skin of toxins and excess sebum. A 30-minute treatment combining deep cleansing and a choice of a relaxing massage, or mask leaving the skin clear and radiant. A perfect introduction to facials or when time is limited. This effective Lifting Treatment, stimulates the facial muscles using a low frequency current which causes a toning action, stimulating the highest number of muscle fibres for instant, visible results. The ultimate anti ageing treatment. 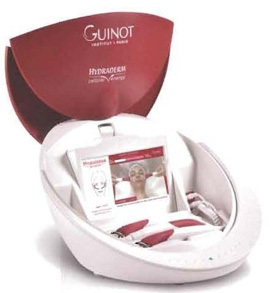 Using Guinot’s unique age logic serum, combined with the Hydraderm lifting treatment, wrinkles will be minimised, facial muscles will be toned and skin’s elasticity will be increased. Hydra Peeling is a skin rejuvenating treatment with two peeling options that are adjusted and prescribed based on the client's beauty goals and level of skin sensitivity. This revolutionary, skin renewal treatment even enables client's with sensitive skin to enjoy the benefits of an enhanced cellular regeneration peel. Hydra Peeling is a unique alternative to aesthetic medicine that erases visible signs of ageing, brightens skin tone and diminishes dark spots. Choose from 5 Signature Facial Treatments. Every Treatment is unique, your Beauty Expert will adapt her movements and products to suit your needs and wishes, a tailor-made facial that delivers optimal, immediate and long-lasting results. At the heart of each Signature Facial Treatment is a 25-minute Anti-Ageing Massage which lifts, reshapes, firms and relaxes. A unique massage that sculpts the contours of the face, giving immediately visible rejuvenating results. This treatment recharges dull, tired and stressed skin with a cocktail of antioxidants and revitalising plant extracts. Skin recovers a healthy dewy glow and early lines and wrinkles are smoothed. Your skin is better protected against lifestyle and environmental aggressors that lead to premature ageing. Helps restore comfort, softness and moisture to dry, dehydrated skin. This multi-level hydration treatment, gives intense nourishment for dry, weakened skin. Dehydration lines are plumped and feelings of tightness disappear - your skin feels wonderfully soft and supple again with its radiance restored. This soothing and healing facial will help calm irritated and sensitised skin. Redness is reduced and your skins recovers its softness, suppleness and comfort. This treatment stimulates the skin to deliver a triple rejuvenating action targeting wrinkles, firmness and elasticity. Wrinkles are smoothed, facial features lifted and your youthful vitality is restored.